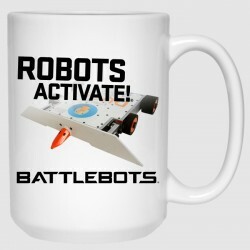 The perfect gift for any BattleBots fan. No home should be without one (or maybe six). Dishwasher and microwave safe.Specifications: Sublimation Print 15 oz Ceramic Mug High Gloss Finish Dishwasher & Microwave Safe.. 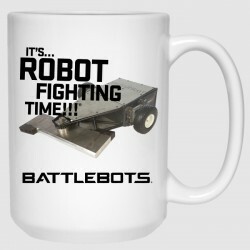 Drink a toast to your favourite bot in these great quality mugs, featuring official production stills from the 2018 season. 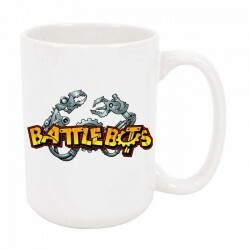 Dishwasher and microwave safe.Specifications: Sublimation Print 15 oz Ceramic Mug High Gloss Fin.. 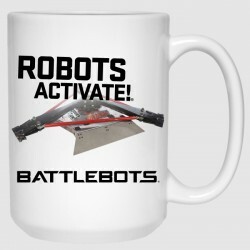 Drink a toast to your favourite bot in these great quality mugs, featuring official production stills from the 2018 season. Dishwasher and microwave safe.Specifications: Sublimation Print 15 oz Ceramic Mug High Glo.. 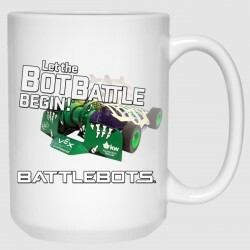 The original BattleBots logo on a quality ceramic mug. Dishwasher and microwave safe.Specifications: Sublimation Print 15 oz Ceramic Mug High Gloss Finish Dishwasher & Microwave SafeNote: Image is printed on both s..